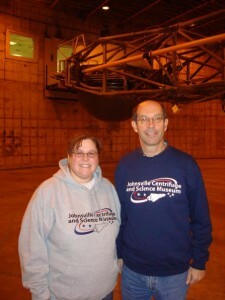 Johnsville Centrifuge and Science Center Goodies! | The Johnsville Centrifuge and Science Museum, Inc. Whether you’re looking for the perfect gift or a piece of the Museum to call your own, we have something for everyone. Museum apparel is now available! Wear it to show your support or buy a gift for someone you know who may have worked at Johnsville. Choose from hoodies ($25), crew neck sweatshirts ($20) or tees ($15) – all in an ultra comfortable cotton/poly blend. We even have some really cool hats! Contact nadcmuseum@comcast.net to get yours today.